Catherine \\\"Kate\\\" Bush, CBE (born 30 July 1958) is an English singer-songwriter, musician, and record producer known for her eclectic musical style and her idiosyncratic sopranovocal performances. In 1978, at the age of 19, Bush topped the UK Singles Chart for four weeks with her debut single, \\\"Wuthering Heights\\\", becoming the first woman to have a UK number one with a self-written song. She has since released ten albums, three of which topped the UK Albums Chart. 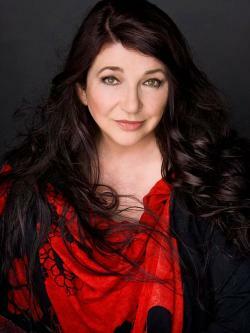 She has had 25 UK Top 40 hit singles, including the Top 10 hits \\\"Wuthering Heights\\\", \\\"The Man with the Child in His Eyes\\\", \\\"Babooshka\\\", \\\"Running Up That Hill\\\" (as well as its 2012 remix), \\\"Don\\\'t Give Up\\\" (a duet with Peter Gabriel) and \\\"King of the Mountain\\\". Bush has been nominated 13 times for British Phonographic Industry accolades, and in 1987 she won a Brit Award for Best British Female Artist. During the course of her career, she has also been nominated for three Grammy Awards. In 2002, she was recognised with an Ivor Novello Award for Outstanding Contribution to British Music. She is the first British solo female artist to top the UK album charts and the first female artist ever to enter the album chart at Number 1. She is also the first (and to date only) female artist to have Top 5 albums in the UK charts in five successive decades. In August 2014, she became the first female performer to have eight albums in the Official UK Top 40 Albums Chart simultaneously; altogether she had 11 albums in the top 50, putting her at number three for simultaneous UK Top 40 albums (behind Elvis Presley with 12 albums in 1977, and The Beatles in 2009 with 11 albums).